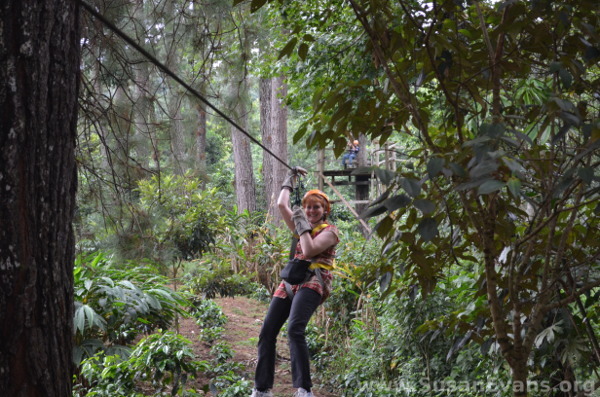 Yes, you heard that right–my family went on a Coffee Plantation Zipline Tour in Guatemala! 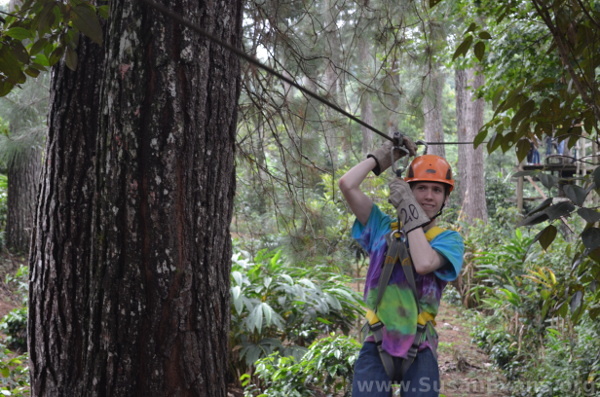 I had been wanting to go on a coffee plantation tour, and I had no idea that someone had thought to add a fun zipline to take in the natural beauty of the plantation itself! There were at least four ziplines that my entire family enjoyed. The final one took the passengers over a lagoon! We found this tour when we googled activities in the Cobán area, since we had canceled our trip to Huehuetenango, and we didn’t know the sights of the area. This place is called Coffee Tour Chicoj, and it is found 10 minutes away from Cobán. 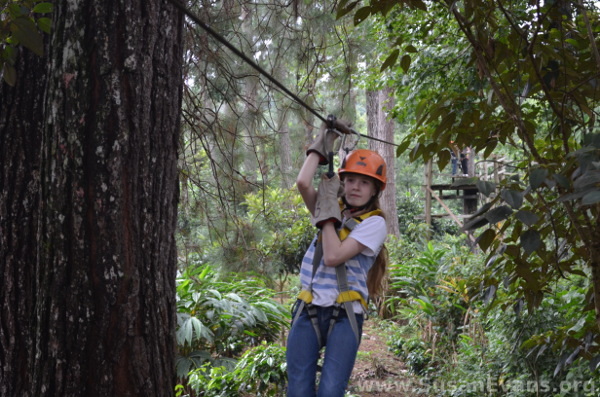 Video of our Coffee Plantation Zipline Tour! Yes, my husband actually filmed zipping along a couple of the ziplines! Ha! He could have easily dropped the video camera, but we decided to take the chance to film it, and I’m glad we did, because now we can relive the ride itself and give others a flavor for how beautiful it was! As I zipped through the air over the coffee trees and tropical foliage, I felt the gentle breeze of the ride against my face. For me, ziplining is one of the most relaxing activities in nature, reminding me of when I was a child and flew as high as I could through the air on swings. I have always loved feeling like a bird, and this zipline tour was no exception. A couple of my kids were a bit nervous about the first zipline, but when they realized that they were secure and didn’t need to hold up their weight but just enjoy the ride like a swing, they looked forward to the next ziplines. All of my kids loved it, even my daughter. The natural beauty of the area is typical of Guatemala, which is why I consider the country to be one of the most gorgeous countries of the world. 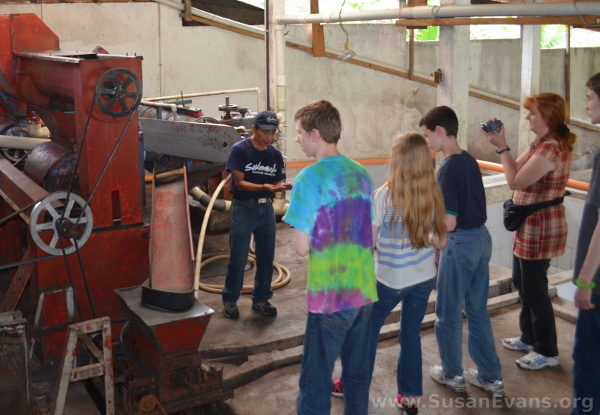 After the zipline tour, we got to see the factory where they process the coffee. Only the best first-class coffee gets produced and shipped to the United States, while the coffee that isn’t good enough gets dried and put back into the soil. The tour guide told us that what they consider garbage is what is used for instant coffee. At the end of the tour we sat down, and they gave each of us the best cup of coffee I have ever had in my life! It was definitely the freshest cup I’ve ever had! 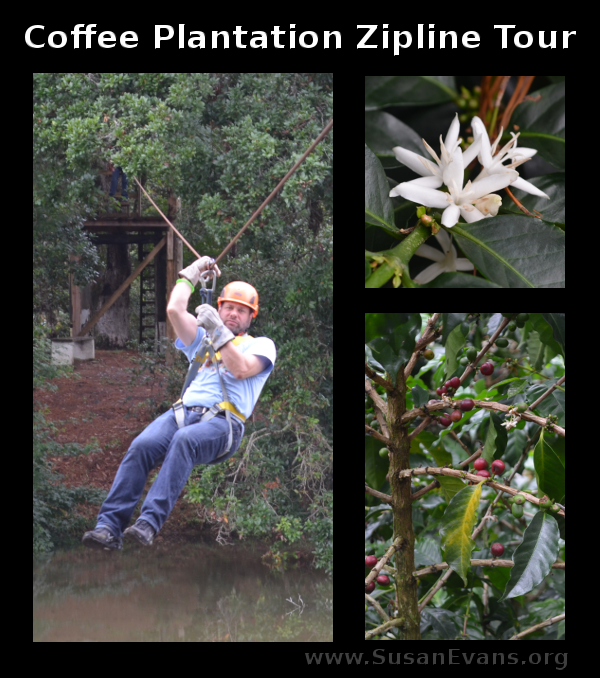 I highly recommend this Coffee Plantation Zipline Tour to anyone who is visiting Guatemala and is in the Cobán area. Stay tuned for out next installment of our Guatemala Adventure series, and like our MK page to not miss any posts! This entry was posted on Thursday, July 27th, 2017 at 7:22 am	and is filed under Travel. You can follow any responses to this entry through the RSS 2.0 feed. You can skip to the end and leave a response. Pinging is currently not allowed. as long as they gave you guys a cup of coffee afterwards! That was the best cup of coffee I have ever tasted in my life! Even my kids liked it! How fun! Believe it or not, I have never been zip lining. 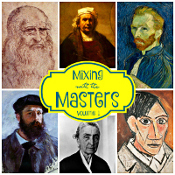 The thought scares me a little, but it reassured me when I read that even your children loved it! I found that hilarious that what they call trash we call instant coffee. Too crazy! Ziplining is not as scary as it looks. It’s actually quite safe and feels relaxing. You should try it! That sounds like so much fun. Family memories like these are priceless. That sounds so fun, I also always loved feeling as free as a bird as a child. I loved the swings ride at the amusement parks because it gave that feeling. I have never tried ziplining, it would make me nervous, but how beautiful it all is! I loved swings as a child. 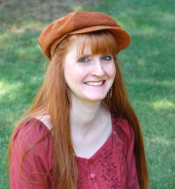 I have always been a free spirit, and floating through the coffee plantation on a zipline was heavenly! That sounds like a wonderful adventure! I bet the coffee was amazing as well. I’ve always wanted to try a zip line! This is basically the ultimate vacation activity for a family: caffeine for the parents and zip lining for the kids! 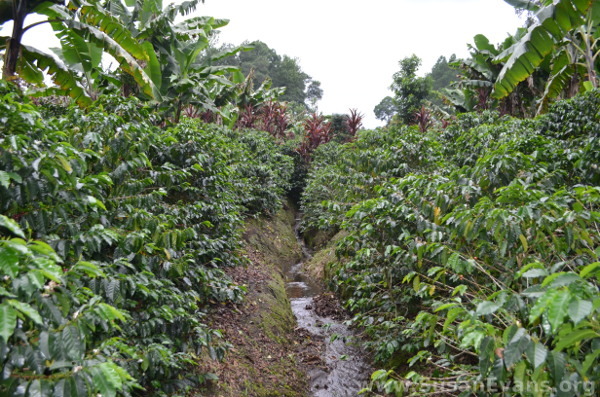 If only we had coffee plantation zip lines locally. 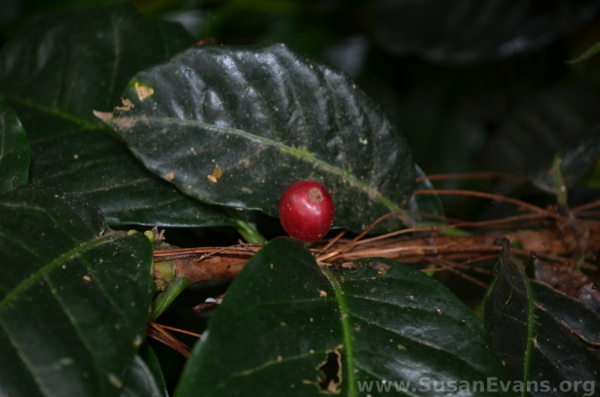 I had the opportunity to tour a coffee plantation when I was in Puerto Rico. It was so interesting to learn about how coffee beans are prepared. What an extra bonus that you were able to zip through the sky. How fun!